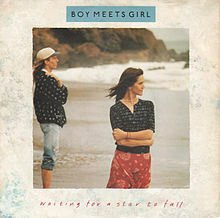 Waiting For a Star to Fall is a song released by the pop duo Boy Meets Girl in 1988. It was a worldwide hit, and became the duo's signature song. Reel Life is the second album released by the duo Boy Meets Girl. Released in 1988 by RCA Records/BMG, the album featured the band's sole top ten hit, "Waiting for a Star to Fall," as well as the minor follow-up, "Bring Down the Moon." Boy Meets Girl is an American duo consisting of keyboardist and vocalist George Merrill and singer Shannon Rubicam. They are perhaps best known for their hit song "Waiting for a Star to Fall" from 1988 and for writing two number one hits "How Will I Know" and "I Wanna Dance With Somebody (Who Loves Me)" performed by Whitney Houston.